Smooth Rock Falls is a vibrant, culturally diverse community that has the intimacy of a small town with the amenities of a large community. It’s a safe, friendly, bilingual place within easy driving distance of Timmins and Cochrane, Ont. 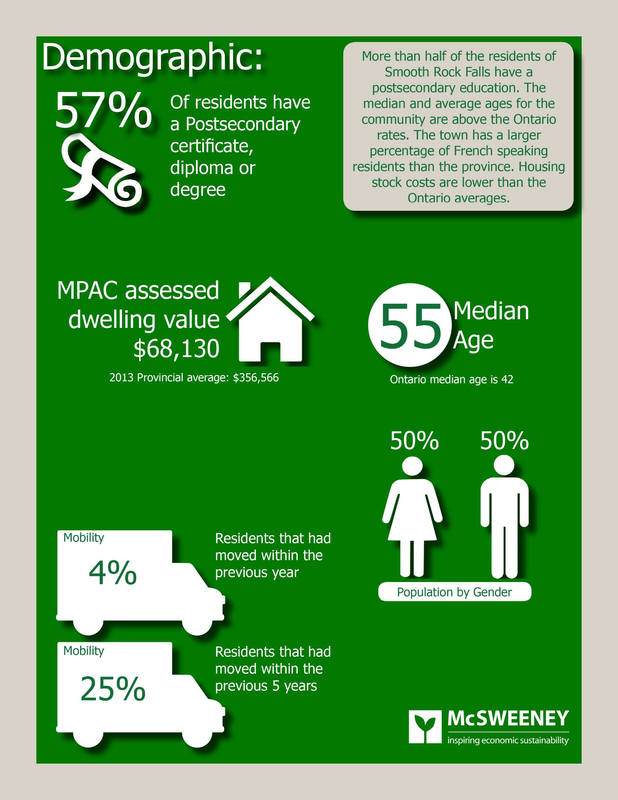 Housing is very affordable; the average MPAC assessed dwelling is $68,100. Smooth Rock Falls is home to multi-level French and English schools, a library, numerous well-maintained recreational facilities and an abundance of clubs, it is an ideal community to raise a family or retire. Smooth Rock Falls is a regional centre for medical care: its state-of-the-art hospital provides 24-hour access for emergencies; serves as a primary care hospital; houses a long-term care unit; and has wait times to see a doctor that are measured in minutes. Established in 1916, along the shores of the Mattagami River, is the Town of Smooth Rock Falls that was incorporated in 1929. The town received its name for an area on the Mattagami River where the water splashes over a large rock smoothed over by fast-flowing water. Smooth Rock Falls is a forward-thinking, collaborative community that is re-inventing itself to attract new businesses and residents. 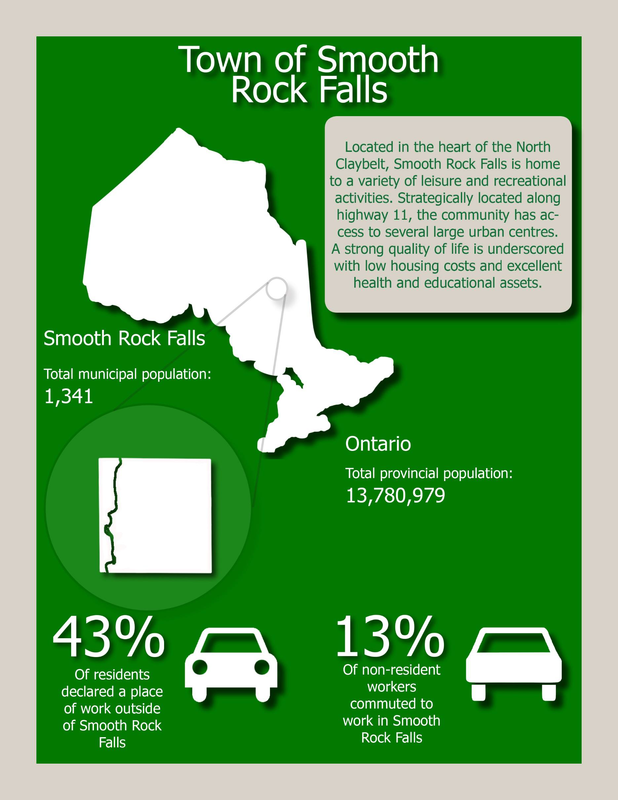 Business opportunities that don’t exist in larger cities are available in Smooth Rock Falls; they are more affordable and there is less competition. And the Town has created financial incentives designed to give people who dream of opening a business but cannot afford to do so the opportunity to realize their dreams. Visit our Programs and Incentives page to find out more. The complete 2016 Community Profile can be downloaded here. The town’s location on the Mattagami River has made it an ideal area for the development of hydroelectric power and other natural resources in Northern Ontario. Smooth Rock Falls is situated on the Highway 11 corridor, between the neighbouring Towns of Cochrane to the east (55 kms) and Kapuskasing to the west (65 kms). Highway 634, originating in Smooth Rock Falls, affords access to seven Hydro Generating Stations to the north. This highway is also the access point to the James Bay Coast in winter – this opens up extra opportunities for businesses who operate in the far north of the province. Highway 655, starting in Driftwood (to the east), provides easy access to Timmins (100 kms south), the larger regional centre. The Ontario Northland Railway is an important provider of freight rail services across Northeastern Ontario. Access to other towns and cities are served by Ontario Northland passenger buses, as well as by air in Timmins, Kapuskasing and Cochrane. For businesses who might need it, there is potential access to the railway right in the town of Smooth Rock Falls.